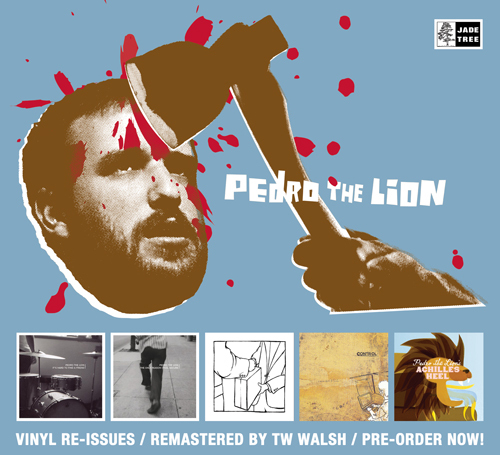 Pedro The Lion Vinyl Remastered Vinyl Re-Issues! Pedro The Lion vinyl is available again after being out of print for several years! Hard To Find a Friend, Only Reason I Feel Secure, Control and Achilles Heel has been remastered for vinyl by TW Walsh. Winners Never Quit remastered for vinyl by John McCaig. We’re offering a limited time pre-order package that includes all five albums, a limited edition custom screen-printed Pedro The Lion turntable slip mat and a 10″x10″ art print signed and numbered by David Bazan. * Limited edition turntable slip mat. * Limited edition signed and numbered art print. This premium package is only available for pre-order until August 31. Slip mats and art prints will not be available as separate items. * Each album comes with a digital download coupon inside to access the remastered tracks. * Album art printed on high-quality uncoated paper. * Records pressed in Cleveland, OH by Gotta Groove Records. All pre-orders will be shipped to arrive by October 30. Customers outside of the US may experience a delay of up to 2 weeks depending on delivery times and customs in your region. Next: Will Johnson & Anders Parker 2012 Fall Tour!